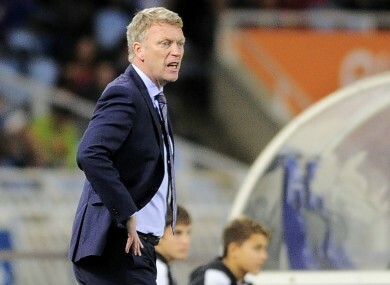 Real Sociedad were beaten by Las Palmas on Friday and the club have opted to sack head coach David Moyes. DAVID MOYES HAS been sacked as head coach of Real Sociedad following the defeat to Las Palmas. Friday’s 2-0 loss mean La Real sit 16th in the Liga table, just two points off the bottom after 10 rounds of matches. Moyes stated after the match that he felt he “must do better”, but insisted he was not feeling the pressure of a potential dismissal despite the mounting speculation. However, Sociedad confirmed on Monday that the Scot’s time in charge has come to an end just under a year since his appointment as Jagoba Arrasate’s replacement. Eusebio Sacristan, most recently Barcelona B coach, and former Valladolid boss Gaizka Garitano are two of the current favourites for the role. Email “As expected, David Moyes has been sacked by Real Sociedad ”. Feedback on “As expected, David Moyes has been sacked by Real Sociedad ”.